Flurry detailed its Thanksgiving app findings in a post to its blog on Friday, noting that at its peak, U.S. app usage was 25 percent higher week-over-week and magnitudes higher than the last two turkey days. 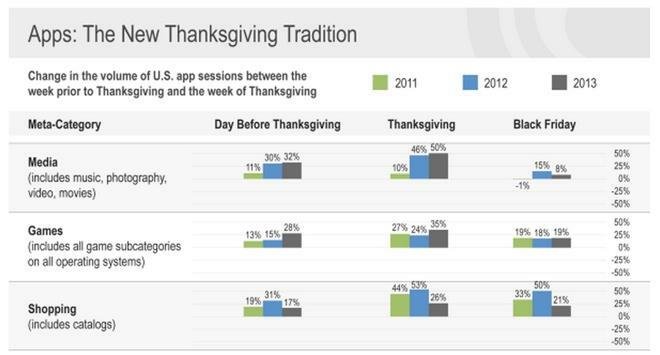 Looking at Thanksgiving 2011 and 2012, the firm recorded 20 percent jumps in app use from baseline levels taken the week prior. It should be noted that the data was taken from a number of operating systems, not just iOS, but can be applied to Apple's operating system as part of a larger trend in app use. While more shoppers are turning to mobile apps for their Black Friday sale needs, 2013 continued an interesting trend in which app use spikes on Thanksgiving day, then slowly drops down to baseline by Cyber Monday. The finding suggests mobile users may be burying their noses in iPhones and iPads during family gatherings. Diving deeper into the data, the firm broke down apps into categories, including shopping, news, games and more. 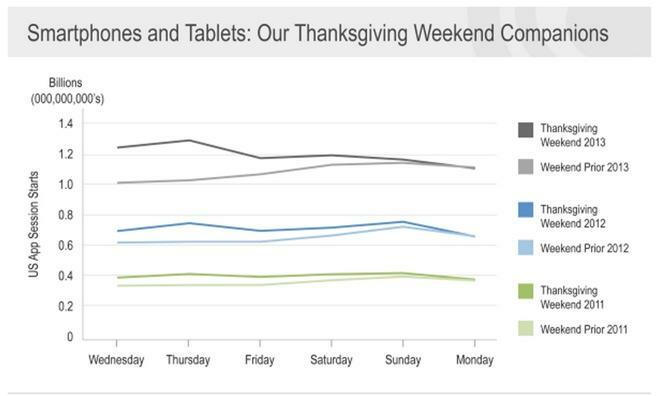 In a chart appropriately titled "Apps: The New Thanksgiving Tradition," Flurry outlines changes in app session volume from baseline over a spectrum of categories on the day before Thanksgiving, Thanksgiving day and Black Friday. By far, the largest change was seen in the Media app type, which covers music, photo, video and movie apps. As seen below, media apps were used 50 percent more than usual on Thanksgiving, higher than the 46 percent seen last year and five times that of 2011's ten percent uptick. Games came in second with a 36 percent jump in usage, compared to 24 percent and 27 percent in 2012 and 2011, respectively. Perhaps most interesting is a drop in shopping app engagement compared to previous years. This past Thanksgiving, usage rose 26 percent from the previous week. In 2012, the same shopping app type saw a 53 percent spike; the highest for any category that year. Further, usage remained steady this year on Black Friday at 21 percent above baseline, while last season's mega sale day saw rates 50 percent higher than normal. The analytics firm points out, however, that overall use of shopping apps in the week before the Thanksgiving weekend swelled by roughly 70 percent between 2012 and 2013, meaning the 2013 spike is on top of an overall higher baseline. Session volume for travel apps fell 32 percent on Thanksgiving to be the biggest loser in 2013, with business and education and news close behind with respective dips of 29 percent and 25 percent. Flurry monitors over 400,000 apps on more than 1.2 billion devices worldwide, though to harvest the data points mentioned above, the firm focused on the U.S. where Thanksgiving is the first national holiday of season.